Cambo Ultima multi shot sliding back CMSL-45 to put medium-format digital camera back on a large-format 4x5 inch camera front. Cambo Ultima multi shot sliding back system, CMSL-45. The advantage of the Cambo Ultima multi shot sliding back CMSL-45 over the Phase One Flexadapter sliding back is that the Cambo Ultima multi shot sliding back CMSL-45 is made for their own camera so fits perfectly. The Phase One sliding back was designed before the Ultima existed, and is about 1mm off (you have to jerry-rig the Phase One Flexadapter to fit a Cambo 4x5 camera). I do not want to need to jerry-rig any $4,000+ attachment, so I selected the CamboCMSL-45 multi-shot sliding back. 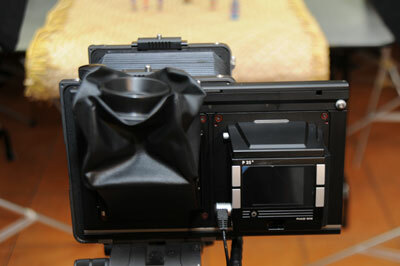 Since I have the 4x5 Cambo Ultima and not the medium format Cambo Ultima 23 series, I got the sliding back model CMSL-45. Information can be downloaded from the Cambo Web site. I always like it when instruction manuals are available from a company web site without having to register or waste your time otherwise. So far I have found the instruction manual for the non-multishot version CSL. Frankly I would recommend buying the multi-shot version. At Photokina every two years in Cologne I have inspected sliding back adapters. These adapters allow placing a Phase One, Leaf, Hasselblad, Sinar, Jenoptik, or Megavision medium format digital back onto a 4x5” large-format camera. The reason is to enable you to utilize a Schneider or Rodenstock lens instead of a Zeiss or Mamiya lens on your Hasselblad, Contex, Mamiya, or Rollei medium format camera. 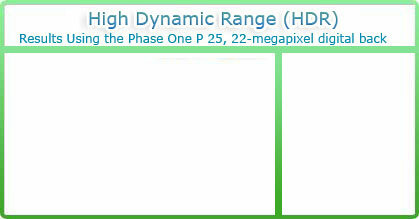 These are great cameras but the large format lenses are considered better. The second reason for using a sliding back adapter is so you can stitch two side-by-side images together to get a larger result. 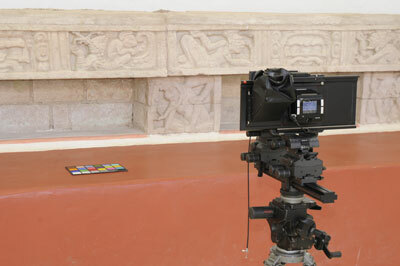 This is best when you are trying to photograph landscapes, architecture or panoramas. But our first use of the Cambo sliding back adapter was in our studio shooting cacao and maize for our Mayan ethnobotany projects. 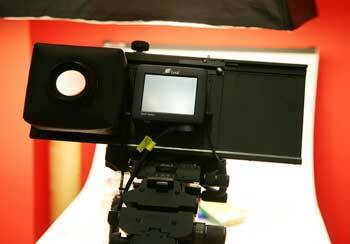 In theory you could use a Cambo multi-shot sliding adapter for an Arca-Swiss or Sinar or Linhof 4x5 camera. 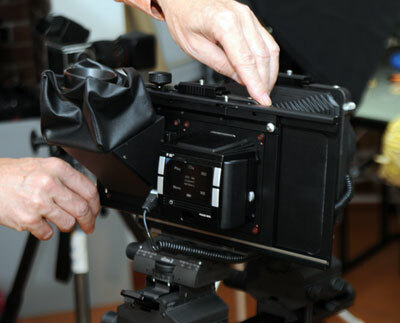 You are not limited to using a Cambo sliding back only on a Cambo camera. Just be sure, however, that you have the proper adapters (and that they exist at all for the camera you wish to connect with). 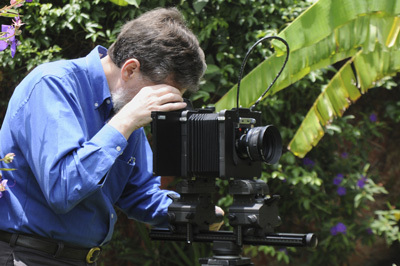 The Cambo sliding back was tested by Nicholas Hellmuth because he has been interested in this photographic tool. Nicholas Hellmuth evaluated the Cambo sliding back in Copan Honduras, when he was studying the Mayan culture during December 2008. You can speak with the Cambo representatives either in the Cambo booth or Calumet booth at PhotoPlus trade show every autumn in New York or every two years at Photokina in Cologne (also in autumn). At other times you can contact Cambo directly in The Netherlands at telephone +31 38 331 4644. Their fax is +31 38 331-5110. E-mail is Cambo@wxs.nl. Their web site is www.Cambo.com. There are already FLAAR Reports being issues this January that describe our experience with the Cambo sliding back adapter. Most recently updated January 16, 2009. First posted Oct 6, 2006. Updated January 2, 2009.